Rabid Elephant’s Natural Gate is an attractive module, adorned with smooth 30mm sliders on a dusky, dark chocolate panel. It’s a two-in-one creation: a dual low-pass gate arranged in mirror-imaged symmetry. Rabid Elephant prefer not to use ribbon cables, but fortunately their (higher-quality) power lead is simple enough to attach; its most visible deviation from the norm is the leaving of four prongs of a standard Eurorack power rail free (the unused CV/Gate connectors). Size: 12HP. Current: +12V = 80mA, -12V = 80mA.Classic low-pass gates are probably best associated with the modulars of Don Buchla. Put simply, these were low-pass filters capable of acting like VCAs. 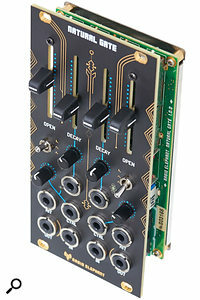 However, Rabid Elephant decided against the vactrols used by Buchla, aiming to produce something faster, more accurate, durable and natural-sounding. If you have any interest in the physics of taps, hits and plucks, you’ll know that the materials used, the velocity employed and even the note frequency are all significant factors in the final sound. Starting at either side of the Natural Gate, a three-position switch sets the material response to hard, soft or somewhere in between. Under the covers, these selections vary the attack and level of the generated envelope, which in turn controls the colour of the output signal. It can even be used without any input signal present; simply feed a pulse to the Hit input (anything over +.25V will do) and it becomes a highly responsive envelope generator, its output fine-tuned for percussive decays when sent to an exponential CV input. 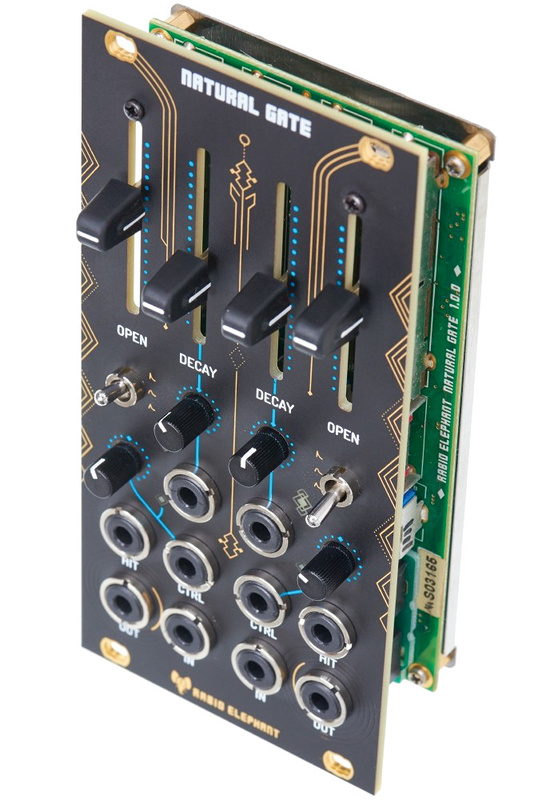 Incidentally, all the I/O is DC-coupled, so although you might focus primarily on adding snap to your audio, it’s capable of processing control signals too. Via the Open and Decay sliders, you can create a wide variety of pleasing clicks, plucks, hits and ringing tones. Since opening the gate effectively opens the low-pass filter, it’s a nice touch that you’re also given manual control via the Open slider. And if you feed an LFO into the Ctrl input, filter sweep effects are possible; or you could send an external envelope signal instead. This will process the Open level ahead of the NG’s own envelope circuitry, aided and abetted by a small attenuverter trimmer — useful for shifting the gate’s span, even without a CV applied. A cute green LED shows whenever the Ctrl voltage is at zero. Decay time has a similar CV input and trimmer allowing you to dynamically change the ringing duration of your hits over and above that built into each of the three materials. Here, every decay shape sounds wonderful and usable, from the shortest, hardest clicks to the most languid, floppy goatskin-type responses. Its realism is boosted by the module’s memory, which has the effect of opening the gate more when you hit faster and faster. If (like me) you’ve ever been frustrated by software envelopes that reset their output voltage to zero on each new hit, Natural Gate is an absolute treat. Further adding to the feel of ‘rightness’, higher-frequency sounds are automatically given shorter decays. This happens with many acoustic instruments, particularly those featuring struck strings. If you don’t wish to exploit this feature of the NG, you could always pipe in a copy of the pitch voltage to the decay time and use it to artificially lengthen the decays of short notes for a more synth-like response. However, once you’re used to the snappiness of the NG, it’s very hard to go back to most other envelopes, at least for anything remotely percussive. The Natural Gate can function as a dual VCA or dual envelope, but it can turn a few less obvious tricks too. By starting with the gate fully open, you could draft in an external control signal to close it down, producing superb side-chain/damping effects. Alternatively, audio rate modulation of the CV inputs unleashes a range of gnarly waveshaping effects thanks to the complex decay profiles. The envelope could be one of the most poorly understood synthesizer building blocks — it’s as if the shaping and articulation of every note is somehow of only minor importance. I can’t think of a better way to grasp the value of a truly responsive envelope than to spend a few hours with the Natural Gate. It can apply a living, acoustic quality to plucked notes, snappy sequences, drum hits and every kind of percussive sound. I can’t recommend it highly enough.